Sought after for its ultra-resilient construction, the contemporary wave pattern design is a very popular site addition. 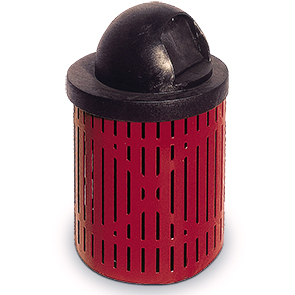 This 32 gallon steel receptacle is a highly functional asset that encourages proper waste disposal—helping maintain clean and inviting, litter free spaces. Built ready for high volume use, the container is made from commercial grade, heavy-duty 12-gauge steel, then finished with an impact resistant, UV stabilized polyethylene coating. Outfit with the available accessory items to meet installation site requirements; five lid styles, rigid plastic liners, cable lid attachments, in-ground and surface mounting kits.